There’s no doubt that one of the biggest challenges in teaching piano students of all ages is imbuing a rhythmic or metrical consciousness. In my experience, younger students, especially, at the primer level of study, want to race off like there’s no tomorrow. They might begin a piece in a steady rhythmic frame but succumb to a certain impetuousness at any point in their playing, finishing more quickly than they had started. The beat has gone out the window before it had a chance to stick around and make a friendly impact on the music. Many adult students as well as pupils of all ages, seem to have a universal resistance to sustaining a unifying beat in their scales, arpeggios, and pieces, and as a teacher, I’ve grappled time and again with how to fix the problem. First off, I’m opposed to using a metronome to treat any student with rhythmic issues. It’s because the device produces robotic pulses that have little relationship to the organic flow of musical phrases. Perhaps the metronome would keep good company with a generator like the one I’d seen onstage during a Milton Babbitt concert at the Oberlin Conservatory. I recall the little old ladies turning down their hearing aids, and individually filing out of rows during the contemporary festival, nick-named the “contemptible” festival because of the droning, impersonal music of that particular era. A synthesized beat went along with it. As one remedy for rhythmic uncertainty, a teacher can conduct as a student plays, but without instilling a “metronomic” beat. She can help to shape a line and its underlying pulse with her voice intoning beats while assisting with her hands and arms. She can enlist a student to sing “beats” with her, as he plays. If she can help frame music without stultifying its flow, she has gone a long way to liberate it from the shackles of any stringent time calculator. For pieces with a combination of quarters and eighths, for instance, a teacher can sub-divide the larger note value by inserting ands following the principle beats. But the same rhythmic ambivalence can occur, unless the expanded beats are spaced, breathed through, and not crowded into a tiny space. A metronome will not remedy faulty sub-divided beat counting any more than it did when ticking off primary pulses. I’ve watched some of the greatest teachers in filmed sequences, working with advanced students, and on a rhythmic level they not only demonstrated phrases vocally, but they conducted, and simultaneously intoned syllables. Conductors steer orchestras in desired directions with all kinds of syllabic babbling. I tend to fall into this vernacular when I teach, and I’m convinced that it’s helpful. In an initial warm-up of the five fingers, where a pupil plays up and down in steps from quarters, to 8ths, to 16ths, I start with sub-divided counting, but inevitably when arriving at 16ths, I sing, double-eedle twodeleedle, threedeleedle, fourdeleedle and it holds the music together. In a scale of four octaves in rapid 32nd notes, I might encourage a student to think in larger groupings of notes, perhaps in a sequence of 8s, so as not to encourage TYPED out playing. In this instance I would also intone syllables rather than numeric beats. If I do this enough times over the course of weeks and months, the student naturally absorbs the routine by osmosis. He internalizes a rhythmic frame. Since children, in particular, learn language by this very same process of mimicry and assimilation, it’s probable that rhythmic cohesiveness can be conditioned by an adult early in the learning process. When I think of tribes in Africa, where complex rhythms and meters produced by native percussion instruments are transmitted from generation to generation without metronomes, I have my answer. In general, students who have difficulty with rhythmic unity can benefit from teaching that encourages relaxation; focuses on the flow of notes in a melodic and harmonic context, and reinforces resilient beats. Each of these pulses must of necessity blend with the form and content of music. Where a teacher sings and conducts through an adagio (a very slow movement) of a composition, she may encourage a flowing pulse, that would not apply to a brisk and cheerful Rondo. The character of a movement or composition would also dictate the type of beat that would underlie it. 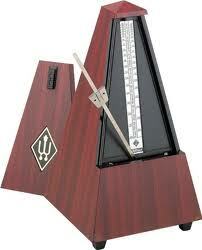 I’m sure there are many fine piano teachers who use metronomes and believe in their efficacy. Though I might not be a proponent of its use in the studio except when needed to consult on the overall tempo of a piece, I’m all ears when it comes to receiving other opinions. I have to confess, I love practicing with the metronome — but not using it as a whip to get faster. I like to set it at very slow tempos so that I really understand and feel the beat physically — main pulse, subdivisions, and so on. And of course, within that try to play musically and with expression. Without doing at least some of this, it is so easy to deceive yourself that you are maintaining the tempo you want. The other benefit of using it is that you don’t have to even think about where the beat is and can concentrate on other things. Amateur musicians I know seem to hate it, though. It’s sad, because it’s really one of the best tools for self-teaching. That, and a good digital recorder. As a 65-year-old adult beginner, I find myself with the problem of speeding up during the course of a short piece. I believe this is due to the difficulty of finding the next note in time – it’s never safe to slow down. 1. it should be possible to accompany an external beat stream, and that stream could be machine-like at times, so if I can’t, it’s a deficiency that practice may improve. 2. If I do manage to synchronize, I really don’t think that will make me machine-like. If I gain the ability to follow the metronome, I can also learn to float around it a bit. The problem isn’t really one of being too mechanical, it’s one of not keeping a steady beat at all. I think that once I stop using the machine, I will still be free to learn to play expressively – that’s a later problem. 3. I can set the metronome to 2 or 4 times the speed of the beat, which can help with the subdivisions during practicing particularly difficult bits. Thanks for your blog. It’s a really rich source of information and perspective. Thanks for sharing. And best wishes in your piano studies. You display a lot of enthusiasm and commitment to practicing. I think your thoughts about the metronome and the way you are applying it make sense. You realize its assets and limitations.. And you are working in and around it to make it the most beneficial to your practicing– imbuing a steady, underlying beat consciousness. I’m lately aware of its positive contribution with a student of 4 years old, who hears ticking metronomic beats on prerecorded CD selections. We’re using Tales of A Musical Journey by Irina Gorin and she believes that the metronome is useful in her instruction. I conduct minus a baton, when my students are here in my studio, and sub-divide the beat along with them.. That seems to be very helpful in the long term. Above all, I try to encourage a slow motion rendering of a piece in the beginning phase of learning so beats will have their naturally, rightful place from measure to measure.